“It is one of the glories of our country that we all have the privilege of being Americans. Some of us were born here of an ancestry that has lived here for generations. Others of us were born abroad and brought here at a tender age, or have come to these shores as a result of mature choice. But when once our feet have touched this soil, when once we have made this land our home, wherever our place of birth, whatever our race, we are all blended in one common country. All artificial distinctions of lineage and rank are cast aside. We all rejoice in the title of Americans. But this is not done by discarding the teachings and beliefs or the character which have contributed to the strength and progress of the peoples from which our various strains derived their origin, but rather from the acceptance of all their good qualities and their adaptation to the requirements of our institutions. None of those who come here are required to leave any good qualities behind, but they are rather required to strengthen and fortify them and supplement them with such additional good qualities as they find among us. “While it is eminently proper for us to glory in our origin and to cherish with pride the contributions which our race has made to the common progress of humanity, we can not put too much emphasis on the fact that in this country we are all bound together in a common destiny. We must all be united as one people. This principle works both ways. As we do not recognize any inferior races, so we do not recognize any superior races. We all stand on an equality of rights and of opportunity, each deriving just honor from their own worth and accomplishments. It is not, then, for the purpose of setting one people above another that we assemble here to-day to do reverence to the memory of a great son of Sweden, but rather to glory in the name of John Ericsson and his race as a preeminent example of the superb contribution which has been made by many different nationalities to the cause of our country. We honor him most of all because we can truly say he was a great American. 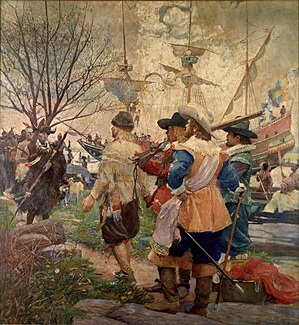 “Landing of the Swedes” by Stanley M. Arthurs, depicting the first contact in 1638 between Swedish settlers and Delaware Indians along the Christina River in what is now Wilmington. They not only cleared and cultivated the forests and prairies but they built churches and charities, established schools and businesses. Despite being “few in numbers…they supported the Colonial cause and it has been said that King Gustavus III, writing to a friend, declared, ‘If I were not King I would proceed to America and offer my sword on behalf of the brave Colonies.’ “ John Mortenson was among the Signers of the Declaration and John Hanson among those to hold the office of “President of the United States in Congress Assembled.” It would be Sweden to become the “first European power which voluntarily and without solicitation tendered its friendship to the young Republic” in 1783. But also, with the removal in 1843 of restrictions in their native land, the large number of Swedish immigrants began their move to America and greater liberty. “As these Americans of Swedish blood have increased in numbers and taken up the duties of citizenship, they have been prominent in all ranks of public life.” They have served with equal distinction not only as governors and mayors, generals and admirals but also painters and musicians. Yet, Coolidge took the occasion to name one of many who exemplified that “old Norse spirit, a true American,” Irvine L. Lenroot of Wisconsin. 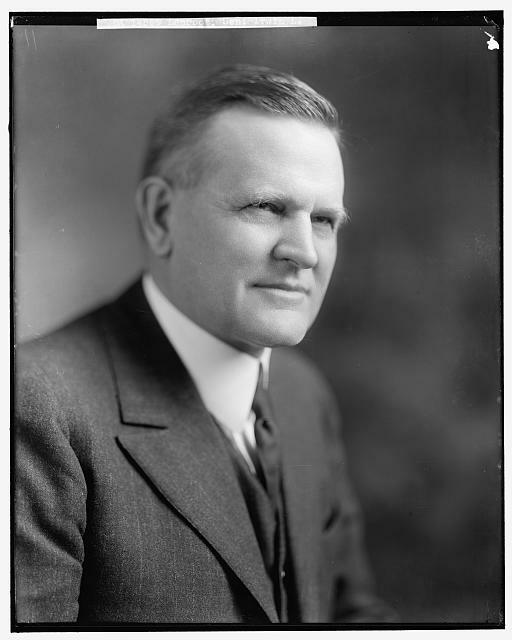 While it is ironic that Senator Lenroot was supposed to be the Vice Presidential choice alongside candidate Harding at the 1920 Republican convention, the rank and file delegates had very different ideas of who was best qualified. Of course, we know their choice fell enthusiastically and spontaneously upon Calvin Coolidge. 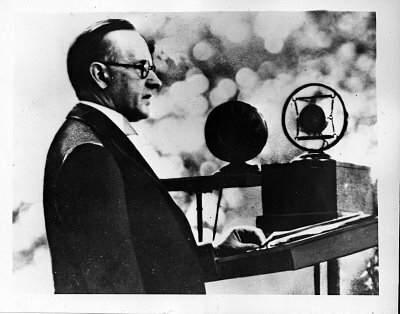 It is noteworthy that now as President in his own right, Coolidge exacts no political gloating or grandstanding. 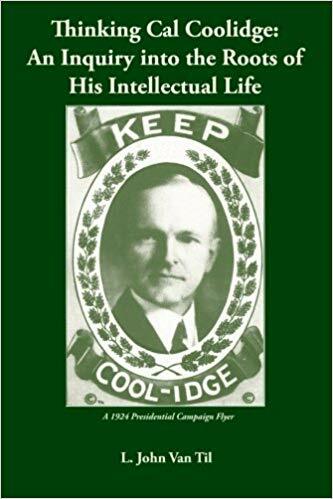 Instead, Mr. Coolidge recognizes his earliest national rival with respect and selfless praise, making his point of American exceptionalism even stronger. 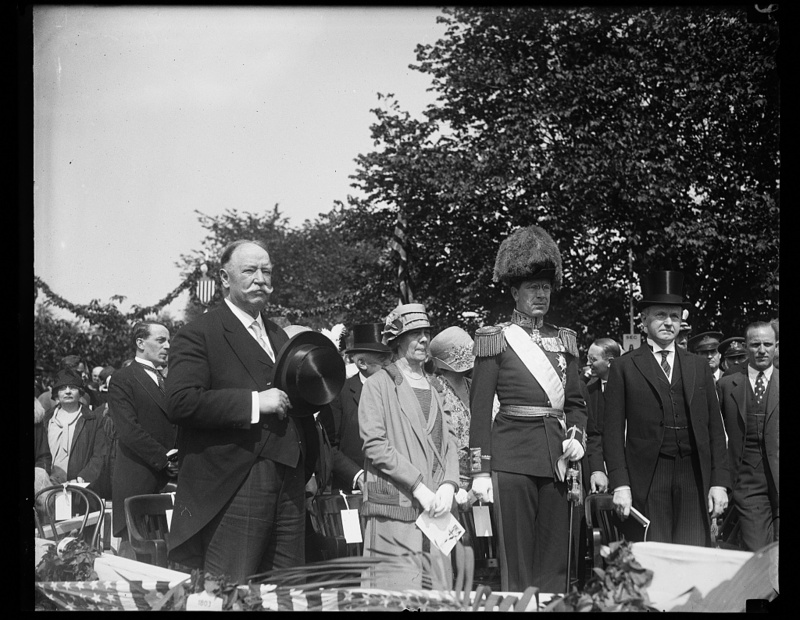 Irvine Luther Lenroot, Senator from Wisconsin, 1918-1927, was the man who “might have been the thirtieth president of the United States.” Coolidge, despite being decisively chosen by the delegates over Lenroot, exemplified dignity and class as his words at this dedication of Ericsson’s memorial illustrate. 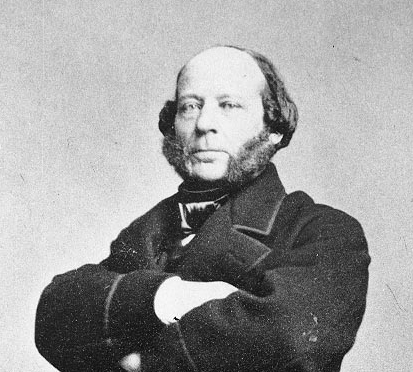 “…Such is the background and greatness of the Swedish people in the country of their origin and in America that gave to the world John Ericsson. They have been characterized by that courage which is the foundation of industry and thrift, that endurance which is the foundation of military achievement, that devotion to the home which is the foundation of patriotism, and that reverence for religion which is the foundation of moral power. They are representative of the process which has been going on for centuries in many quartered of the globe to develop a strain of pioneers ready to make their contribution to the enlightened civilization of America.” The strength of America is not in its multicultural diversity, the non-essentials that keep us divided, but in its ability to attract and assimilate so many good qualities around a shared identity, a common set of principles, creating a new union of peoples called Americans. 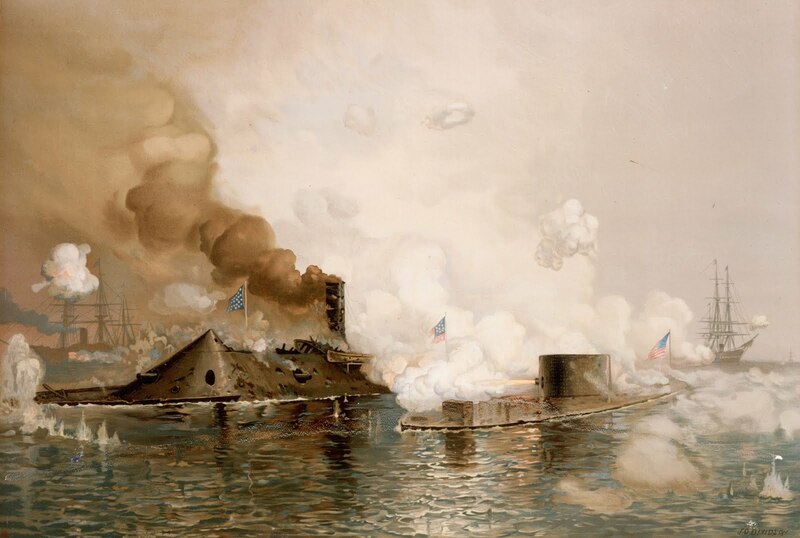 The USS Monitor battles the CSS Virginia, formerly the USS Merrimac, Hampton Roads, March 8, 1862. Depiction by J. O. Davidson. 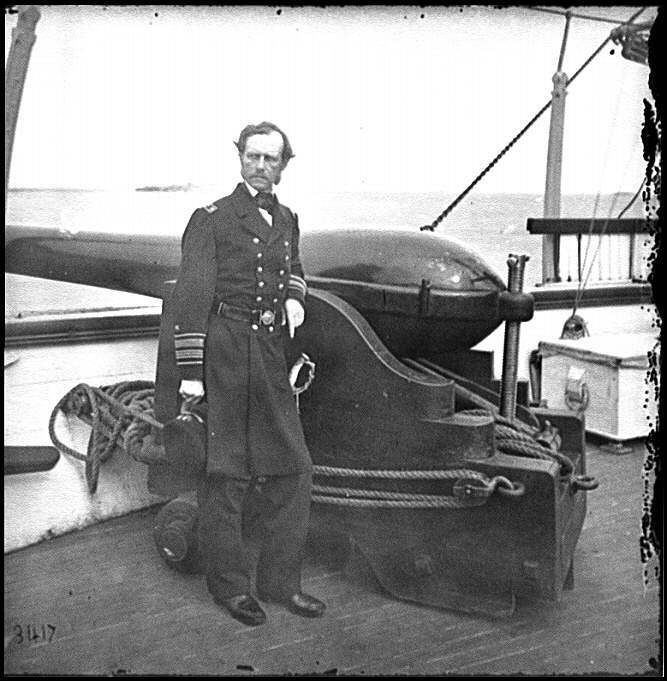 Admiral John A. Dahlgren, beside one of his inventions, a 50-pounder Dahlgren rifled gun. His “soda bottle” design ensured greater safety and accuracy in artillery operation. The Monitor had two such guns. 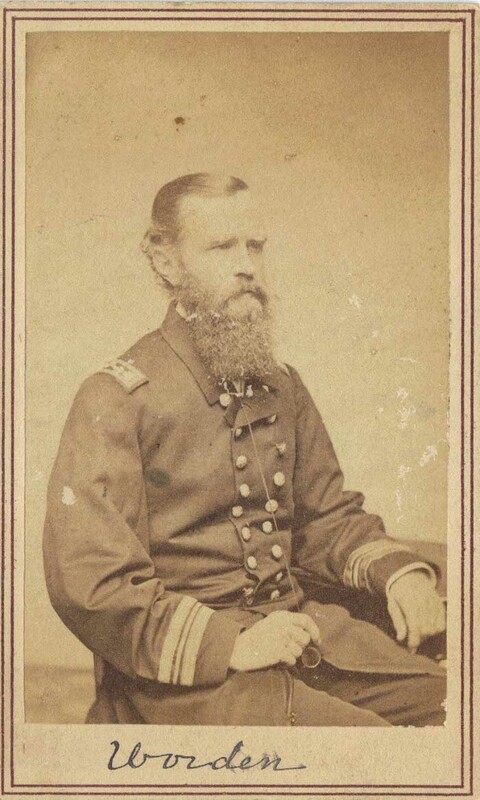 Lieutenant John L. Worden, commander of the Monitor in that historic match between steam-powered ironclads, March 8-9, 1862. 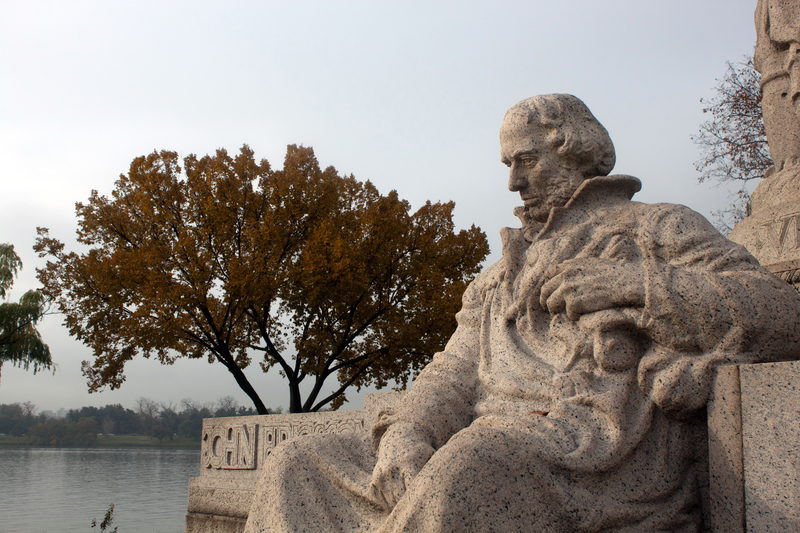 The John Ericsson Memorial, sculpted by James Earle Fraser from pink Milford granite. Fraser would create some of the most iconic images of modern time, including the Indian head on the Buffalo nickel, the bronze of General Patton at West Point, the Franklin Memorial in Philadelphia and the Contemplation of Justice atop the Supreme Court Building in Washington.